KLE Society’s School, Gadag, was started in the year 1998 to provide quality education of world standards. It empowers every child to excel, to achieve, to win and to lead. We train students to radiate excellence in knowledge and life skills. We owe it to the future generation to prepare them to take part in life and succeed in all their endeavors. School is a spirit that brings every student alive. Talent cannot be forced out of the people. The school recognizes every student potential, coaxes it out of its hesitant shell, nurtures it and allows it to bloom. Education is about facing life, finding joy in all that we do, greeting with a radiant smile. Children deserve the opportunity to become fundamentally happy citizens with basic and professional competencies to take part in and develop a society. 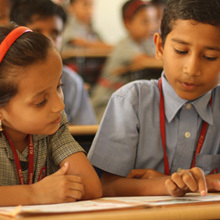 The School is spacious and centrally located in Gadag. The place is well connected with road and railways. It lies around 60 kilometers from Hubli by road and railways. The school is affiliated to the Prestigious Central Board of Secondary Education (C.B.S.E), New Delhi, Affiliation No: 830235. The students who pass in the CBSE Senior Secondary Examination are eligible for admission to Universities and Colleges in any country. The curriculum is rich, dynamic, stimulating and relevant to the 21st century. It is definitely a world class curriculum meeting the highest standards nationally, internationally and preparing the students for the 21st century. Powered by darshan design-pro Pvt. Ltd..